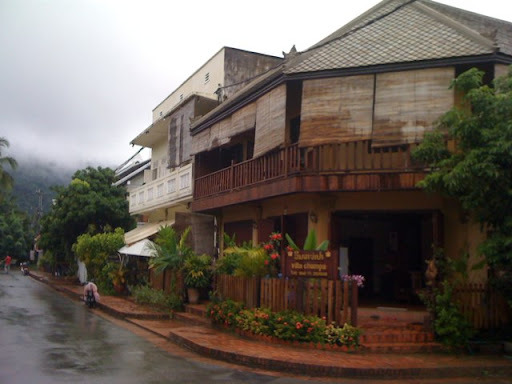 Having moved into our new digs at Villa Champa (pictured), our second day in Luang Prabang (Monday) was a blast. After eating in the town's best bakery, JoMa, we oriented ourselves by climbing the tall hill (with steps) in the middle if town, called Phu Si. It was filled with beautiful bronzed buddhas, and Jackson loved every one of them. After all, "buddha" is one of his many new regular vocabulary words. Another of his favorite words is "monk," which he loudly blurts out every time he sees one of the orange and yellow-clad young monks walking around town, usually with an umbrella to block the sun. They always turn to him with a look of "OK, that would be wildly inappropriate normally but I'll permit it this time since you're so cute." You see, tourists are not even supposed to take photos of monks, but everyone does it, while usually trying to be respectful. We finished the day with our first real fancy traditional Laos meal, consisting of lots of spicy appetizer sauces, Mekong River weeds with seame seeds, and omelets with spicy peanut sauce. That was at a place, called Tamarind, around the corner from our new guest house. Highly recommended.